The blunders resulted in the sacking of two of USAF's most senior officials. A three-star general will head the new command, part of a project aimed at shaking up USAF's nuclear mission. "This is a critical milestone for us. It's a new starting point for reinvigoration of this enterprise," said Air Force Secretary Michael Donley. "It is an extremely important mission for the United States Air Force." In June, Gen T Michael Moseley, USAF chief of staff, and Air Force Secretary Michael Wynne were both asked to resign by Defence Secretary Robert Gates after a report revealed that the security of US nuclear weapons and parts had been in question. The report cited two embarrassing incidents. The first occurred in 2006 when electrical fuses for ballistic missiles were mistakenly sent from a US base in Wyoming to Taiwan in place of helicopter batteries. The B-52 crew had been unaware they were carrying the fuses. The Chinese government, which vehemently opposes US arms sales to Taiwan and has threatened to attack the island if it declares independence, was informed by the US about the error. 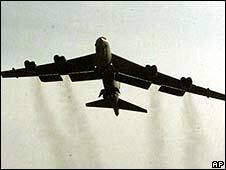 The other embarrassing incident occurred last year when a B-52 bomber mistakenly armed with six nuclear-tipped cruise missiles flew across the country, without anyone realising the weapons were on board. The new Global Strike Command will be established by September 2009, said officials. All nuclear-capable B-52 and B-2 bombers and intercontinental ballistic missiles will be shifted from their current locations in Virginia and Colorado to the new command. Officials did not disclose the location of the new command or how much the re-organisation would cost.